Happy Saturday! I posted this post the other day and then took it down. However, last night, my hubby and I started watching footage of the late prolific scholar Dr. Amos Wilson, and I decided to repost. In the profound words of Mystical, “Here I go!” As a matter of fact, let it bump it loudly (in memory of Jordan Davis) as you read the post. This is so unrespectable. I'm probably what society would consider a "good" Black person. I've gone to college and beyond. I've never had any legal problems. I know how to speak the King's English (when I feel like it). My husband and I are both well-educated and employed with solid, respectable career paths. Since sharing the news about our baby, I've been told, "I'm so glad you all did it the right way.” Ugh. The girl-with-the-super-religious-upbringing in me gets what they’re trying to say, but they can keep their judgment to themselves. I have some wonderful friends and family who built their families differently from me, and it doesn't make their family any worse or mine any better. I meet most of the criteria to pass the respectability politics test, at least when I'm in public. Yet, I'm over respectability politics. What is respectability politics you ask? Well, in short, it is the idea that if Black people conform to a certain way of being, we'll improve our conditions and have larger society deem us as “worthy.” Got some new for ya: IT WON'T!!! This article sums up my argument nicely. She's a beautiful writer. In this age of twerking scandals, cultural appropriation, and racially-coded language guised as political policy, I could write an entire diatribe about this topic (After re-reading this, I think I have). Recently, I’ve witnessed respectability policing all over the internet - from bashing Black women about their TV watching choices, to asking why "we" allowed ourselves to be enslaved (I had to sit on my hands when I read this), to being upset with President Obama for launching a new initiative for Black boys; and I quote, "The damn government is trying to assist because of our failures." I get the sentiments behind the statements, and, in some cases, I even believe some of these rants have some merit. Miss me with the slavery one, though, mmkay? Could some members of our community rethink some of their parenting practices? Sure. Can and should Black people do their own community building and economic development? Absolutely. I’m all for self-determination. My major issue is this: We cannot do these things in the hopes that dominant culture will find us worthy and acceptable. Further, we cannot act like the issues that face Black people are solely of our own doing. We don't live in a vacuum, and to ignore structural and institutional injustice is simpleminded. I think we can control our own destinies and hold society's oppressive “feet” to the fire. When the George Zimmerman case seized the summer, I wrote a piece that defended Rachel Jeantel and challenged those who made fun of her looks, diction, and demeanor. I stepped on some toes because I received emails/inboxes and responses to the post that were to the tune of "But how can we expect them (i.e., White people) to respect us when we present ourselves like Rachel?" My retort: "What does her diction or appearance have to do with her deserving respect as a human being?!?" I haven't written anything of this nature in a while, and since I haven't been here in a minute, I'll end my post by sounding off about a few of the respectability-politics-laden occurrences that get under my skin. I'm sure some of these won't be popular. People who came to Richard Sherman's defense using the argument that he went to Stanford as a reason to not castigate him - It shouldn't matter where he went to school, and further, this situation just goes to show that doing the "right" thing doesn't give one a respectability pass. It shouldn't matter if he barely passed community college and spoke in completely broken English; he didn't deserve the harsh, racially-charged unwarranted criticism that framed his being in the moment as being a thug. I’m also glad he didn’t buy into the BS and rightfully called out his naysayers for their racially-coded language. HBCU dress codes - Now if you read my posts, you know that I love my alma mater FAMU, but dang, HBCUs!!! Get progressive! College is a time for exploration and discovery of self. Making students cut their locs to be "professional" or forcing male students who prefer to wear women's clothing to change their dress is unfair and stifling. Because I attended a Black college, I know that these kinds of rules come from a place of concern about students' professional trajectories (and a deep-rooted adherence to respectability politics), but I think many of them have failed to realize that "success" doesn't always come clothed in a business suit with straight hair. I also understand the "look the part" argument, but I think a first step is to make sure that students even want the part we're trying to force down their throats. Stupid memes about Black women - "We used to be queens (insert some picture of "dignified" Black women) now we're here (insert the cast of a reality TV show either fighting or twerking.) Again, SIMPLEMINDED. This stupid sh@t gets posted by people who know better, people who are in constant contact with successful Black women, people who ARE positive Black women. Newsflash: We can be dignified AND reserve the right to twerk when the situation presents itself. These things aren't always mutually exclusive. It's complicated. This really deserves a separate post. More on this on another day. Whew! 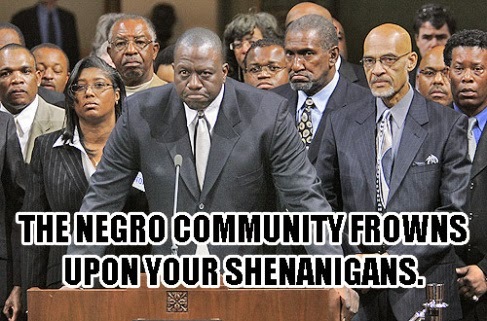 Simply, to summarize: Respectability politics is for the birds. Yuck. I think I've got my blogging mojo back. Now let me go see if I can harness this writing energy into something productive for work. Until next time . . . Love yourselves.